OK. 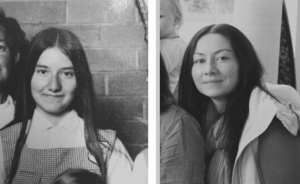 So in my last post I talked about Mum’s recent DNA test and how it was quite a surprise. Well, I guess there were two surprises really. First – her ancestry. When Mum was younger, she was always asked about her ancestry, and she was often asked if she has Asian ancestry. (I mean Far-east Asian and not Indian as ‘Asian’ is usually referred to in the UK). This Asian connection was entirely plausible given Australia’s Gold Rush period and at the time many of Mum’s family lived in the Gold Rush areas around North-West NSW (between Sydney & Brisbane). And to add to our suspicions, her grandmother (Nanna Morgan) looked very much like a sweet old Chinese lady (One day I will find a photo of her). My sister Victoria also has had the same experience as Mum, and is always asked about her ancestry. Once, in our local Chinese restaurant, a family came to our table and spoke to her in Chinese thinking she was a visitor! As well as Asian ancestry, the other possibility was an Italian or Spanish connection because of the olive skin (I’m only jealous a little bit!). Maybe some of those legendary smuggling ancestors from the Cornish coast! But all of this was just supposition and family lore, because so far the paper trail showed nothing but English ancestry to the early 1800’s. But, there was clearly a link to something exotic there somewhere and before the DNA results came in we all took a straw poll on what we thought Mum’s ancestry would be made up of – most of us had a fair percentage of Asian. But oh how wrong we were! In my last post I mysteriously referred to a ‘Region x’. Well … ‘Region x’ turned out to be Scandinavia! And at 75% Scandinavian ancestry it had to be more than just distant Viking relatives in the family!? But this is a place that has never flagged as a connection in any research so far. Not even hinted at. Saying Mum had Martians for ancestors might have made more sense! But at least the olive skin was explained by 9% southern European ancestry (across Italy & Spain)…but so much Scandinavian? So what then was the second surprise….